Interesting stuff... along the lines of unknown human prehistory. The discovery of a pyramid and a sphinx in Niger lends support to my theory of an African dominion before the time of Noah (B.C. 2490-2415) under the control of Chadic and Kushite rulers. Cain, Seth and their wives were of the ruling houses of this ancient African civilization, as were Lamech the Elder and his son-in-law Methuselah. Dr. Clyde Winters refers to this as the Proto-Saharan Civilization. 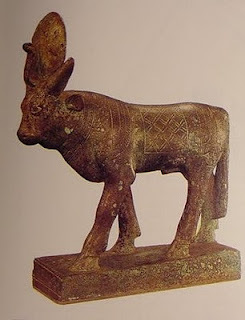 The Proto-Saharans venerated cattle and left behind engravings of bulls or oxen with solar discs between their horns. This image was associated with Hathor, the Virgin Queen whose son was Horus. In the oldest known Messianic tradition the Son of God is born as a calf to Hathor who is portrayed as a sacred cow, and the birth took place in a stable with the Babe sleeping in a crib. The oldest known site of Horus worship is Nekhen in Sudan and dates to the time of the pyramid discovered by Garba. The pyramid of Dan Baki is 4500 years old, about 1000 years older than the Giza Pyramids. It is in an advanced state of deterioration, but was not open when it was discovered by Nigerian Egyptologist Souley Garba. 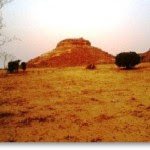 In February 2012, Garba announced his discovery of a pyramid in the village of Dan Baki, 20 km west of the city of Zinder and 2 km north of the village of Tirmini. Garba estimates that the yet unopened pyramid contains more than 40,000 gold objects. The Dan Baki pyramid has a twin nearby and appears to be part of a series of pyramids located in the region of Tanout. All the pyramids in the neighborhood appear to have remained sealed. Mr. Garba reports that this discovery is the "result of our activities we have been carrying out over 7 years and with a private institute of the United States of America." Garba explained that years of study of the hieroglyphic texts led him to the name of the village where he discovered the pyramid. He believes that the point of origin of humanity is in Niger. From there people spread into Chad, Nigeria, Sudan, Egypt, Yemen and Saudi Arabia. He has not attempted to explain the presence of more ancient monuments in Southern Africa, Turkey and China. Study of the ancient hieroglyphic texts reveals a close affinity between Ancient Egyptian and Hausa. The names Tanout and Dar-Gaza constantly recur in the hieroglyphic texts that Garba studied. Dar-Gaza means “crown of God” and refers to the Sun. Gaza is a variant of Giza. Hausa is in the Afro-Asiatic (or “Hamito-Semitic”) language group. This group includes Akkadian, Ancient Egyptian, Arabic, Aramaic, Amharic, Babylonian, Chadic, Ethiopic, Hahm/Jaba, Hebrew, Phoenician, Sumerian and Ugartic. The diversity of this group is amazing! Chadic alone has 600 dialects.